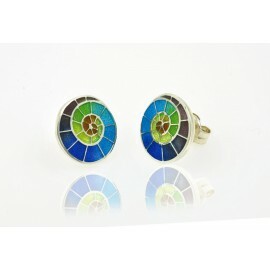 Gaudi Tile earrings, reproduction of the pavement that is in the Passeig de Gracia in Barcelona. Antonio Gaudi designed this tile with marine plant and animal motifs, called hexagonal pavement. Handmade in silver plated metal. 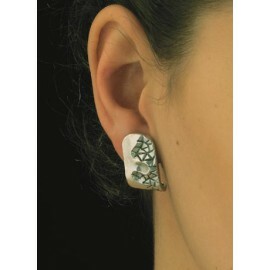 Sterling silver earrings, glazed with fire, with the trencadis so famous by the architect Antoni Gaudí. Earring made of silver enamelled on fire. Gaudiblu collection. 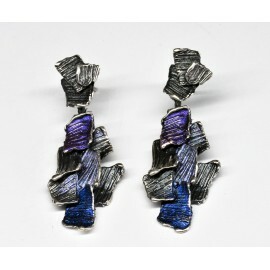 These silver earrings made with silver mixed with colored pigments, through new enamel techniques. Earrings inspired by the alignments of nature, recreating the image of reeds, trunks, rushes ...From art, he advances towards the rational mastery of the geometry that we find in nature and materializes it in this jewel that is expressed with forcefulness beyond science and any mathematical theory that wants to explain it. Made in Sterling Silver, this unique piece will shine in your ears. All our pieces are handmade in Barcelona City with our unique and exclusive fire enameling technique. 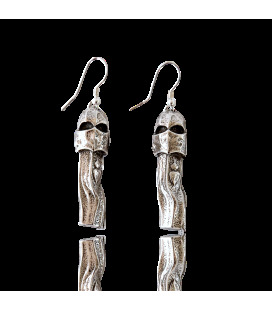 Gaudi Chimney La Pedrera earrings, reproduction of one of the chimneys, also known as "warriors", of La Pedrera. Handmade in silver plated metal. 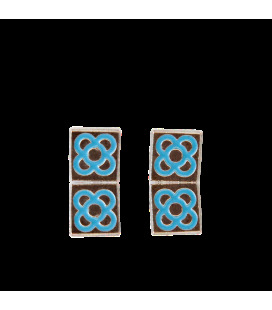 Barcelona Flower earrings, reproduction of a very common modernist tile in the streets of Barcelona. Handmade in silver plated metal and enameled in colours. 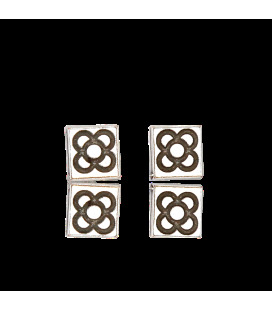 Barcelona Flower earrings, reproduction of a very common modernist tile in the streets of Barcelona. Handmade in silver plated metal. Original earrings made of silver, handmade. Gaudiargent collection: The design of this jewel is inspired in the sinuous and soft curves of the "trencadís" banks of the the Gaudí's Park.The look slips for them as a water drop. Sterling silver earrings, chiseled handmade. Earring made of silver enamelled on fire. Earrings made of silver enamelled on fire. Gaudiblu Collection. Modernist earring made of silver enamelled on fire. Gaudiblu Collection. Earrings made of silver enamelled on fire. Earring enameled in fire with our exclusive technique. Hand-made in Barcelona with .925 purest Sterling Silver. Big Modernist Enamel Earrings Earring enameled in fire. Hand-made in Barcelona with 0.925 purest Sterling Silver. Blue Sterling Silver Earrings Made in Sterling Silver, this unique piece will shine in your arm wrist. All our pieces are handmade in Barcelona City with our unique and exclusive fire enameling technique. Gaudí mosaic salamander earrings made of rhodium plated metal, encrusted with multicoloured Swarovski® crystals. Gaudí mosaic salamander earrings made of 18k gold plated metal, encrusted with multicoloured Swarovski® crystals. Add the matching pendant or ring for a refined look. Gaudí mosaic heart earrings made of rhodium plated metal, encrusted with multicoloured Swarovski® crystals. Add the matching pendant for a refined look. Gaudí mosaic stud earrings made of rhodium plated metal, encrusted with multicoloured Swarovski® crystals. Gaudí Art stud earrings made of rhodium plated metal, encrusted with multicoloured Swarovski® crystals. Arracades inspirades en les escales que l'arquitecte Antoni Gaudí va dissenyar, utilizant la tècnica del trencadís. The Modernism (of Gaudí) and the Contemporanian Art inspire the design and the own style of each one of these work arts.These jewels are made by the millennial techique of the enamelled on the fire which rests impregnated on the gold and the silver. Medium Modernist Enamel Earrings Earring enameled in fire with our exclusive technique. Hand-made in Barcelona with 0.925 purest Sterling Silver. Earrings made with silver glaze enameled on fire. The Modernism (of Gaudí) and the Contemporanian Art inspire the design and the own style of each one of these work arts.These jewels are made by the millennial techique of the enamelled on the fire which rests impregnated on the gold and the silver. 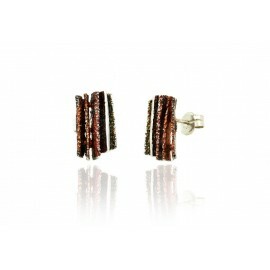 Earrings made of silver enamelled of fire. The Modernism (of Gaudí) and the Contemporanian Art inspire the design and the own style of each one of these work arts.These jewels are made by the millennial techique of the enamelled on the fire which rests impregnated on the gold and the silver. They are made with silver mixed with colored pigments, through new techniques of enamel. The pigment gives life to life. It transmits joy, modifies moods, illuminates the eyes of the observer and, symbolically, it is associated with positive emotions. Earrings enamelled on fire. The Modernism and the Contemporanian Art inspire the design and the own style of each one of these work arts.These jewels are made by the millennial techique of the enamelled on the fire which rests impregnated on the gold and the silver. Blue dragonfly earrings enameled with fire. Turquoise dragonfly earrings enameled with fire. Red dragonfly earrings enameled to fire. These jewels are made following the millennial technique of enamelled to the fire that is thus impregnated on silver and gold. Modernism (by Antoni Gaudí) and Contemporary Art inspire the design and style of each of these small works of art.